Saving Even More Money By Shopping the Sales Cycles! 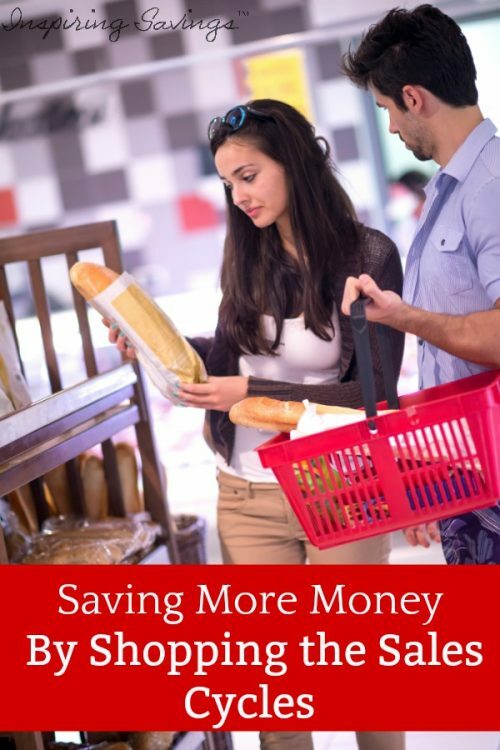 Home→Frugal Living→Grocery Shopping→Saving Even More Money By Shopping the Sales Cycles! Ever wonder when grocery items go on sale at your local grocer store? It’s called a grocery sales cycle. Save even more money by shopping the sale cycles. The Big secret to saving money on groceries is not the couponing. Seriously, did I just say that? Yes, I know it is hard to believe. The secret is knowing what price you should pay for an item. It’s very easy to get swept up in a sale, especially that famous B1G1 or 50-60% off sales. Grocery stores and manufacturers work hard to push out their best sale prices to you on a weekly basis through their store circulars. If you follow along closely, you’ll notice that most products operate on a 6 -8 week sales cycle. You’ll also find that “product families” all go on sale at the same time. For example; P&G products will be discounted the same weeks and will return to their regular prices for a few weeks, then go back on sale together. At the very least, you need to know what price is the everyday price, a good price, and a great price. If you are the primary grocery shopper and well aware of pricing this should come easily to you. However, if you are not sure, the next time you go to the grocery store for a little shopping make a point to start keeping a mental list of the items you purchase regularly. You can even go one step further and start a list at home. After all, who could know the best price for every item from memory? Start a price book. Record basic information about the products you buy regularly, including how much you paid for an item when you bought it, and where you bought it. Once you really start to understand those sale prices you will soon start to notice you won’t need this price book anymore. But it may be fun to look back years later to see how prices fluctuated from when you first started. When your favorite items are at their lowest rock bottom price that is when you purchase them and stock up for the next sale. Remember that prices in food fluctuate every 6-8 weeks. What that means is there will be another sale on those items you just purchased (maybe not the same brand name). To maximize your savings, keep track of the sales cycle among major supermarket competitors in your area. You may find that one chain is best on canned food items sales, while another has the best deals on condiments. You may also find that one store always has the best price on some products, regardless of a competitor’s sales cycle. For my local area, Hannaford food stores are always the lowest regardless of the sale cycle. The time to use coupons is when food pricing for an item is at its lowest price. Spending your money wisely and making the best possible decisions while shopping, will greatly improve your savings at the store. There are seasonal exceptions to this sale cycle rule. I have noted them below. July – MORE BBQ foods, school supply sales begin. December – Thanksgiving clearance items (decorations, napkins, etc.) and all Christmas dinner and baking items. I have a more comprehensive list here, that goes over in more details all the grocery sales month by month. Make sure you review this list, especially if you are in the market for things other than grocery store items. Now you are equipped with this money saving tip – it is now your turn to Save Even More Money By Shopping the Sales Cycles!